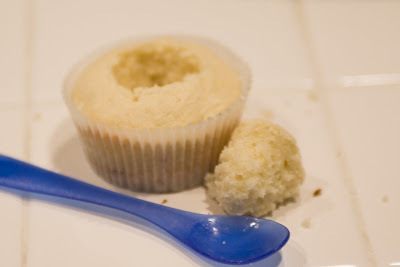 I first started by making a crust for the bottom of my cupcake with macadmia nuts. This year, it's all about the cupcake with a crust at my house. I wasn't going to waste this opportunity to make one with the most perfect nut on earth. 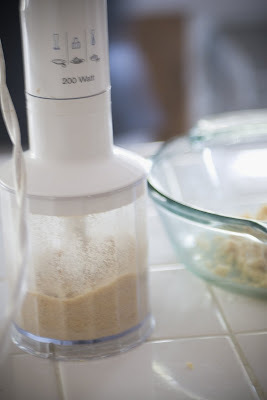 For starters grind your macadamias very fine with a food processor. Next, you'll want to grind your vanilla cookies. Now, when I go to this point I realized I didn't have any regular old 'nilla wafers in the house and I didn't want to use graham crackers because, well, they woul just be too grahamy (yes, totally word.) The next best substitutes I had was these... 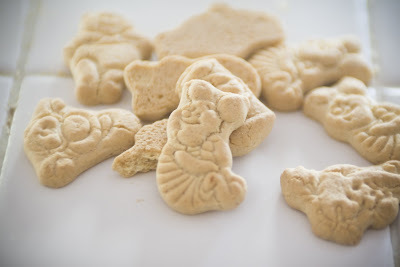 WARNING... piglet and 100 acre wood lovers beware, these little cuties are going in the food processor... sorry Pooh Bear. Finally, add 2 TBS of melted butter and mix all together. 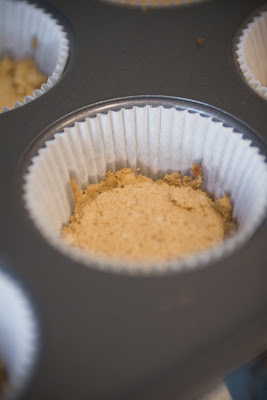 Spoon about 1 TBS of the mixture into the bottom of each paper liner and press down using the bottom of a thin glass. Bake in the oven at 350 for 10 minutes. Remove and cool. Next, make your Lemon Filling, this needs time to chill, so make it now and it can be cooling off while your making the batter and buttercream. Mix all ingredients in saucepan. Bring to boil; boil 1 minute, stirring constantly. Remove from heat and chill before using. I chill it in the fridge. Now it's time for the cupcakes. Now, for these bad boys you need coconut milk and DESCICATED coconut. This took me for FOREVER to find. I finally found it at a little natural foods shop here under the name of macaroon coconut. 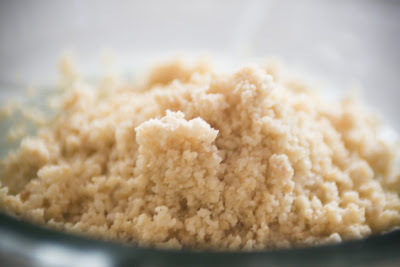 Basically you are looking for coconut that is unsweetened and very dry and ground very fine. 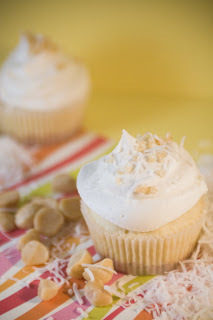 Now, since my real issue with coconut is it's texture, I ground it even finer and it eliminated any feeling of the coconut in the cupcake and just left the mellow sweet taste. Perfect. Combine butter and sugar together. Add eggs, milk and vanilla. Sift together flour, salt, baking powder and add to the wet mixture. Add coconut and stir just enough to combine. Fill the crust filled paper liners about 2/3 full and bake at 350 for an additional 20-22 minutes. Cool completely. Now it's the time to make the frosting. 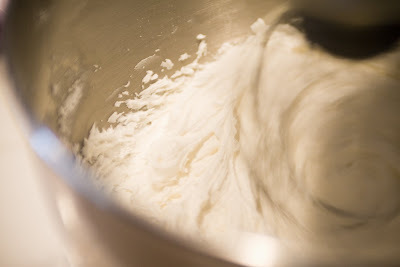 Whip butter til very smooth. Add the white chocolate. Slowly start adding powdered sugar and milk alternating. Once all incorporated, turn mixer on high and whip for about 5 minutes. Set aside for piping. 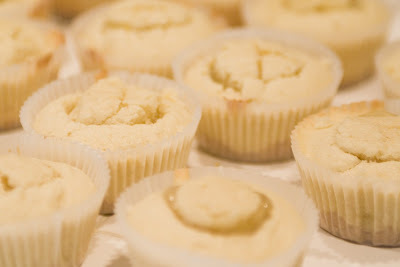 Overall, these cupcakes turned out better than I expected. Like I said before, I'm not really a coconut girl and I still found these very yummy. I think the key is the ground coconut and the coconut milk. They add the flavor without any of the awkward texture. 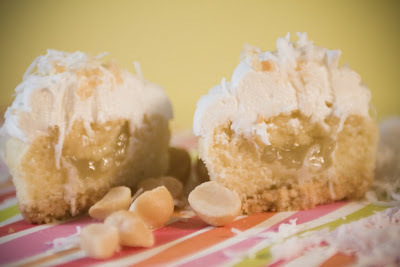 My hubby referred to them as culinary dynamite and I have a few friends who love coconut and couldn't get enough. 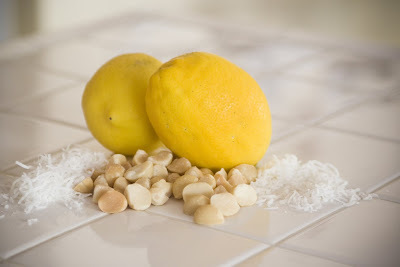 I also think the lemon filling creates a really nice refreshing bite to the other mellow flavors. And I mean, come on, there's a crust made out of freakin' macadamia nuts... seriously how could it be bad? as well as a pair of cupcake earrings from LOTS OF SPRINKLES at http://www.etsy.com/shop.php?user_id=5729584. 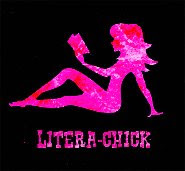 a t-shirt from UPWITHCUPCAKES.COM http://www.upwithcupcakes.com/. Iron Cupcake:Earth is sponsored in part by 1-800-Flowers, http://www.1800flowers.com . why, Why, WHY, do I not live near you!!! 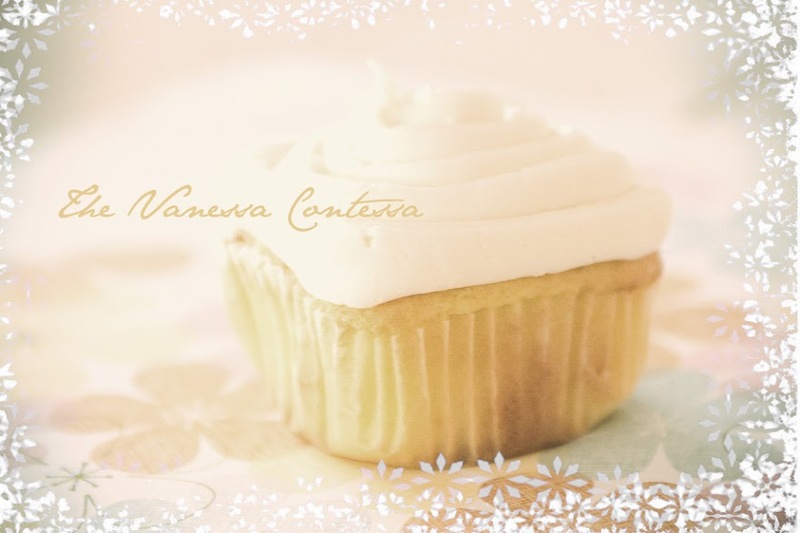 These look delicious and your photos are gorgeous! i think this might be my favorite one yet. i love macadamia nuts! beautiful! I could really go for one of these right now. 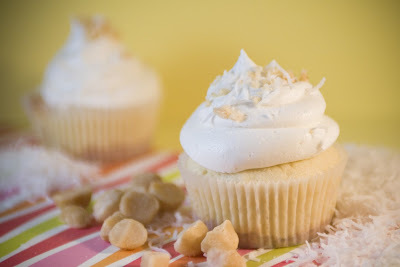 I've been cleaning up baby throw up all morning and something lemony and coconut sounds real good. I'll vote for you. 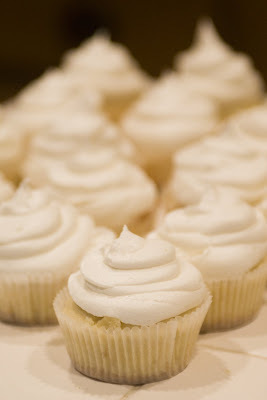 Your cupcake entry looks delicious and your presentation and photo are top notch. Now that I see you are a photographer I can see why. This is an awesome cupcake! I tasted it and I am a fan. I looked at all the other cupcake entries and I think this one should definitely win.